Three brands in particular went against the grain of yummy #NationalCerealDay tweets. National Cereal Day Twitter feeds full of colorful images of sugary cereals and smiling cartoon character marketing mascots were interrupted on Thursday by unappetizing videos from Fruit Gushers, Busch Beer, and Modell's Sporting Goods. 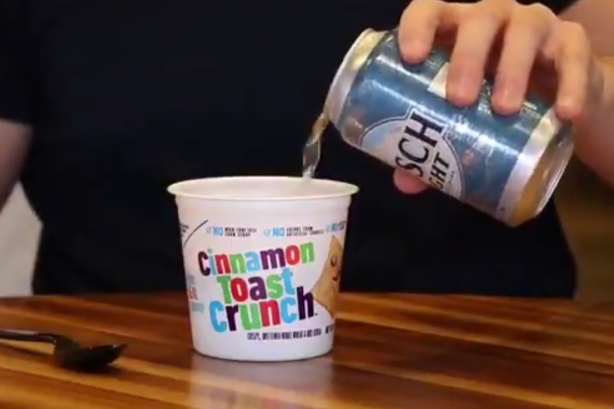 Care for some beer in your Cinnamon Toast Crunch? How about pouring some milk over that bowl of Gushers? And who doesn't love a bowl of sneaker deodorizers to start the day? As #NationalCerealDay continues, win a pack of Sneaker Balls. RT post, follow @modells, and tell us your favorite cereal to win. What brand ruined #NationalCerealDay on Twitter?